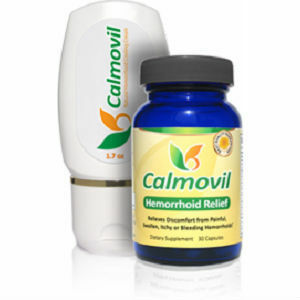 The makers of Calmovil claim that this is a natural, safe, and effective form of hemorrhoid relief and treatment. Calmovil is a two part treatment consisting of a soothing topical cream and an all-natural supplement. They claim to have quality botanical ingredients which have been formulated to work synergistically for optimum results. Calmovil is formulated to support healthy veins, improve blood flow, and reduce inflammation. A natural bioflavonoid with anti-inflammatory properties. It strengthens the walls of veins and prevents bleeding. An anti-inflammatory and vascular protecting agent. Improves capillary and connective tissue health. Keeps veins strong and elastic. Enhances the body’s ability to fight blood clots. The recommended dosage for the Calmovil supplement is to take one pill daily, and to use the cream up to four times per day as needed. A month’s supply of Calmovil is around $50.00. The makers of Calmovil offer a 60 day full refund including shipping cost for anyone not entirely pleased with the results for any reason; restricted to one return per customer. John Parker	reviewed Calmovil	on October 22nd	 and gave it a rating of 2.5.